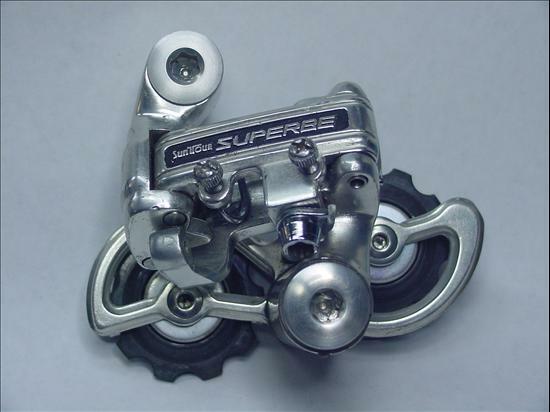 This is the 1st Superbe Pro rear derailleur offered by Suntour. It appeared in the 1979 Japanese catalog and disappeared around 1983 with the introduction of the RD-5200. This derailleur is often confused with the RD-2100 model as with a quick glance they look very much the same. Notice that the RD-3100 has no labeling for the PRO designation on its body! Both pivot bolts are aluminum alloy and have no engraved markings on them. The 2100's are engraved plated steel. The Cable Attachment bolt is a Allen Key style vs the hex head bolt of the RD -2100. The pulley attachment bolts are flush allen head vs yet again hex head bolts on the RD-2100. Due to the above items this derailleur weighs 25 grams less than the RD-2100. There are two variations of the RD-2100 and RD-3100 in which the internal coil spring mounting bolt was either a hex head bolt for the early models (Aug-1980 and Prior) which changed to a flush Allen head bolt on later models (Aug-1980 and Later). From my body date observations the RD-2100 and RD-3100 derailleurs used the exact same body and there appears to be two major time frame lot runs. One lot was made in mid-1977 through early 1978 (Early model) and then a later run happened at two points in mid-1980 and early 1981 (Late Model). I have currently found few models of either derailleur with a body date code from the years 1978 or 1979! However, since the PRO version was introduced in 1979 those would have appeared using the body manufactured much earlier. This is the second lightest rear derailleur ever built by Suntour, as the Cyclone Mark II (RD-3500 Short Cage) beat it by 9 grams! Albeit I think the RD-3100 has the Mark II beat in the "looks" department. The bikes, that I know of, which came delivered with this dérailleur were the 1980-1981 Rampar (Raleigh) Superbe, 1981-1983 Fuji Professional, 1983 Fuji Opus III and the 1983 Bridgestone World Criterium. I would be interested in hearing of others. Albeit, the non-pro RD-2100 version came on many high end brands from the 1979-1980 time frame. Details: Suntour's Superbe Pro competition components are the very best bicycle components you can buy. Their simple and elegant styling, outstanding quality in materials and finish, extremely precise design and manufacturing tolerances and race-proven efficiency assure optimum performance and looks for any custom frame.